We love to encourage you to make constructive and sustainable changes in your life. You don’t need to practice yoga every single day or give up your favourite treats cold turkey. All you have to do is focus on one or two small changes that will make you happier, every single day. If you’re trying to shift a diet related change, a great approach is to “swap not stop”. This might mean swapping your morning coffee ritual for a green tea or, in this case, swapping store-bought, processed chocolate for this delicious Raw Chocolate Bark. Instead of reaching for that chocolate bar (or block!) next time a sweet tooth strikes, spend minutes whipping up this healthier alternative. 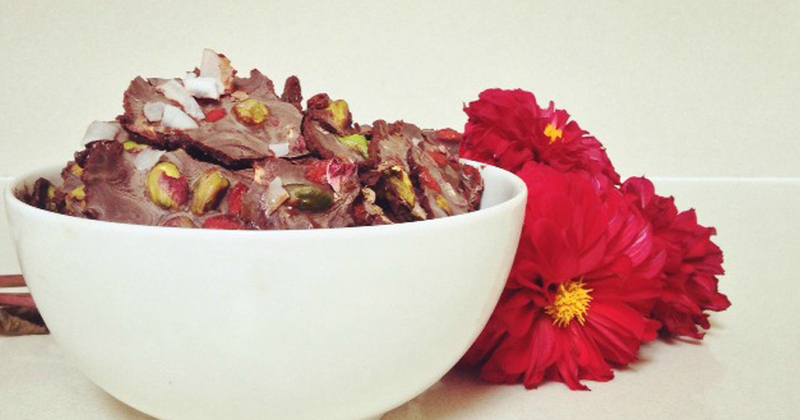 This bark recipe features pistachios, goji berries, coconut and rose petals. Play around with your favourite combinations of nuts, seeds and dried fruits for a unique (and VERY tasty) treat. Line a baking tray with grease-proof paper. Set aside. Combine melted cacao butter, cacao powder, coconut nectar, vanilla and salt in a bowl and whisk until smooth. Pour chocolate mixture into baking tray and sprinkle with pistachios, goji berries, rose petals and coconut flakes. Transfer tray to freezer for 15 minutes. Once chocolate has solidified, remove from freezer and break into small pieces of “bark”.